When we asked Melia Kreiling what is her favourite cinema, she answered like this: «At most cinemas, the audience usually gives the screen its undivided attention. But some parts of the world still enjoy ‘open-air summer cinema’. It unpretentiously endeavours to broaden the viewing experience while maintaining the romance of movies by virtue of the venue itself. 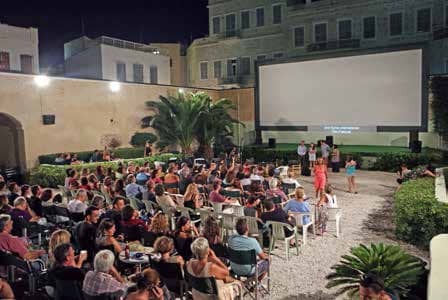 Greece hosts a huge number of open-air cinemas. My personal favorite is the Pallas Cinema, on the island of Syros (actually in Hermoupolis, named after Hermes, the Ancient Greek messenger god)». The Pallas serves fresh popcorn, organic sunflower seeds to pop-open between your front-teeth. And an excellent strawberry slushy, plus a perspective to die for. It screens blockbusters, indies and also hosts the Syros International Film Festival. It is hosted within the courtyard of an 1855 landmark building, and is located on the corner of Miaouli Square. Miaouli is one of the oldest squares in the country: it also hosts the majestic Town Hall and the beautiful public library, all dating back to the 19th Century. Attending the Pallas, though, is not for the movie-goer that demands HD picture quality or immersive surround-sound, above all else – although, in a sense, the experience really doesn’t lag far behind. No, the Pallas is for those wanting nostalgia, along with a broader experience than merely the film. So, with the ground sprinkled in white gravel, moving around this cinema is no silent affair! Your arrival and exit magnified by your every movement. And that’s cool! The clickety-clack rumbling of stones, rasp of the night-crickets, and the film’s ever-so-slightly diffused sound due to the absence of any ceiling. It is actually the sound of a perfect summer night – and, moreover, it’s a sound that won’t be ‘sssshhhushed’ by anyone. The surrounding courtyard comprises various types of palm trees, cherry-pink bougainvilleas, and deep-green trimmed hedges. And the auditorium walls are painted ochre-orange and feature archways to the screen’s sides. What makes it all even more beautiful is that outside the cinema walls are Neo-classical buildings, as well as family homes inhabited by residents! They sometimes watch, or listen to, the film-of-the-week from their balconies and terraces… for free. I’ve been on such a balcony – looking down at the screen and at the audience of attentive, transiently-lit, faces. I can say that it’s quite a unique experience. Further, these buildings frame the screen so perfectly, it’s truly hard to become distracted. Barbara Windsor: "Going to my favourite cinema was my reward"
Open-air cinemas, such as the Pallas, are the kind of venue where newly-acquainted lovers touch. Old-flames rekindle, claustrophobics may relax, and mosquitos will feast upon you (should you naively have neglected to use bug-repellent). It’s also where smokers will light-up, judgement-free. Families connect, children may be left unsupervised. Movie-lovers keep up with new releases and older classics, alike, without foregoing the essence of their summer ‘tech switch-off’. The Pallas is magnificent, quaint, romantic, casual, local, exotic. All of these things, while at the same time bravely keeping pace with the times. Melia Kreiling, best-known for her recent role as ‘Bereet’ in ‘Guardians of the Galaxy’, is currently appearing in the second season of ‘Tyrant’, and will also star in the female lead role of ‘Stella’ in Red Bull’s first fiction feature: ‘DxM’.